Having the correct pressing tools helps to achieve quality workmanship. Pressing is important, as you are about to find out. It may take time to acquire your own equipment, but you will soon find you are unable the live without these tools, as theyreally do give great support when pressing beautiful fabric. 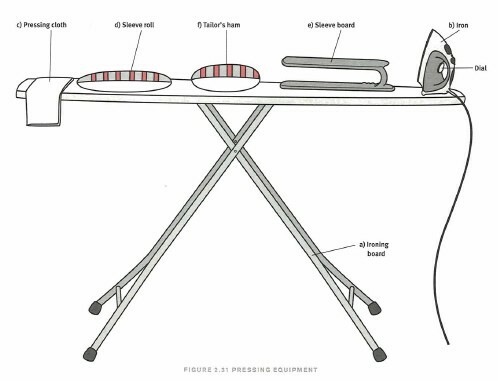 An ironing board is used for ironing clothes and linen (Figure 2.31a). Ironing boards can be freestanding, built in, pullout, or fold away. 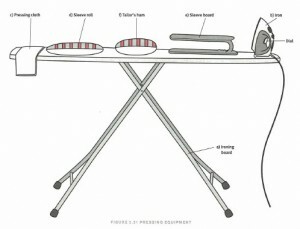 Whichever style of ironing board is used, the padded work surface should be heat resistant. An ironing board has a cotton ironing board cover that should be replaced when damaged or worn. A steam iron is used for pressing seams, hems, and the final garment (Figure 2.31b). The iron has a metal plate that smoothly glides over the fabric. An iron has a temperature dial to control the heat. On domestic irons the dial is marked with fabric types such as “linen/cotton,” “wool/silk, and “synthetic.” At school it’s not that simple, as the dial is numbered 1,2,3,4,5. The numbers on the dial indicate the following settings: number 1 is the lowest setting and corresponds to fabrics that require low temperatures, such as synthetics, rayons, and so forth; number 2 corresponds to silk without steam; number 3 corresponds to wool and is the beginning of adding steam; number 4 corresponds to linen; and number 5 is the highest setting, with the most amount of heat, which in the case of the gravity-feed irons is really hot! Change the heat temperature to match the fabric type when pressing. It is advisable to press a fabric sample first before pressing the garment. A pressing cloth is a square of open-weave cotton or muslin fabric about the size of a men’s handkerchief (Figure 2.31). Actually, a white men’s handkerchief is the perfect pressing cloth! The pressing cloth is placed over the fabric surface for protection and to prevent the iron from leaving shine marks. The cloth can be dampened to provide extra steam when pressing. A natural-colored piece of silk organza also makes an excellent pressing cloth; since it is sheer you can see what you are doing when pressing. Wool/mohair can be used as a press cloth for tweeds and knits; it works like a needle board, preventing the nap from being flattened when pressed. A rectangle of wool /mohair can be stitched to have a single layer of cotton such as muslin on one side and be finished on all sides with a serger. A seam roll is a firm cylinder-like cushion covered with cotton on one side and wool on the other (Figure 2.31d). A seam roll is used to press long, narrow seams such as the inseam or out seam of a pant leg or underarm seams. Use the cotton side for pressing most fabrics; the wool side can be used for pressing woolen fabrics. Using a seam roll helps to avoid seam impressions that might otherwise show to the correct side of the garment after pressing. A sleeve board is a small-scale wooden ironing board with rounded, padded ends (figure 2.3e). It is a wonderful pressing tool. It is used for pressing sleeve, short seam, and hard to get at area that do not fit over a regular sized ironing board; It can also be used on the rounded ends to stem east at the cap of sleeve. If you make half-size muslins at school, the sleeve board is excellent for pressing a smaller size.